MaxVigen™ anti-rabbit IgG nanoparticles are ideal for antibody purification and immunoprecipitation assays. MagVigen™ Protein anti-rabbit IgG recognize and efficiently bind to the Fc part of immunoglobulin (Ig) following a short incubation. The generated nanoparticle-antibody complex can be separated from the rest of the sample by magnet. The retained antibody can be eluted from the nanoparticles using an elution buffer. 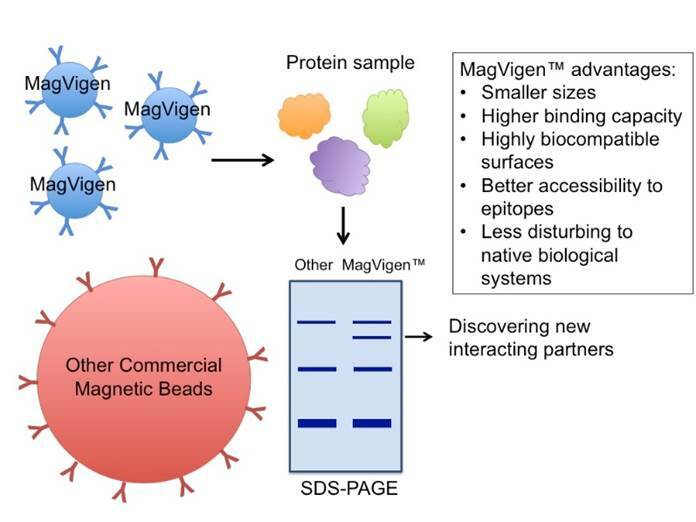 MagVigen™ nanoparticles enable identification of new protein-protein interactions through immunoprecipitation assays, where the MagVigen™ anti-rabbit IgG -antibody complex can be used to isolate particular proteins of interest or protein complex from assay samples, e.g. cell lysate. The immunoprecipitated proteins can be further analyzed by electrophoresis, protein staining, and mass spectrometry. MagVigen™ nanoparticles are much smaller than conventional micro-beads. This feature allows for better accessibility of the nanoparticles to the antigenic epitope and for less disturbance to the native functions of proteins or protein-protein complexes. In addition, the surfaces of MagVigen™ nanoparticles are uniquely coated to reduce non-specific interactions with cellular proteins and other biomolecules. This feature allows for a more specific pull down of real protein complex targets. Cat# 21006: MagVigen™ – anti-rabbit IgG nanoparticles (Cat# 21006) are provided in phosphate buffered saline (PBS), pH 7.4. Each vial contains 1 ml of solution with a particle concentration of 1 mg/ml, which is enough for approximately 20-200 antibody enrichment or immunoprecipitation assays. Washing Buffer (10X), 15 ml, Cat# A20001. Elution Buffer, 15 ml, Cat# A20002. This protocol was optimized for enrichment of 1-10 μg rabbit or mouse antibody in a volume of 100 μl . For a smaller size of sample, it is recommended to add extra Washing Buffer to reach a 100 μl reaction volume. For larger scale of purification, adjust the amount of reagents accordingly. Dilute 10X Washing Buffer with PBS to 1X. Take 5-50 μl nanoparticle solution (for 1-10 μg antibody), add it to 100 μl 1X Washing Buffer, and vortex to mix. Wash nanoparticle-antibody complex with 100 μl 1X Washing Buffer twice and remove supernatant. Wash nanoparticle-antibody-protein complex with 100 μl of Washing Buffer for three times. Gently vortex MagVigen™ nanoparticles before use. Take 20-50 μl nanoparticle solution (for 0.5-5 μg of Rabbit antiobdy) and add it to 100 μl 1X Washing Buffer, and mix well. Separate the nanoparticles from the solution by placing the magnet on the side of the tube for 1-2 min and remove the supernatant carefully (with magnet still on the side). Add 100 μl sample solution containing desired rabbit antibody to the nanoparticle pellet, mix well, and incubate with gentle rotation for 0.5-2 hours at room temperature or 4°C overnight. After incubation, use the magnet to separate MagVigen™-Rabbit antibody conjugates from the solution and remove the supernatant. Wash MagVigen™-Rabbit antibody conjugates with 100 μl 1X Washing Buffer twice and remove supernatant. Elute captured protein from the nanoparticles by adding 90 μl Elution Buffer, mix well, and incubate for 1 min at room temperature. Separate the nanoparticles from the eluted rabbit antibody with magnet. Transfer supernatant to a clean tube and immediately neutralize the eluate by adding 10 μl Tris (1M, pH=8.0). The purified protein is ready to use for subsequent evaluation. Note: some Rabbit antibody may not be stable using this elution method (steps 9 and 10). Please choose appropriate elution method for specific application. This protocol provides a general guidance for enriching 105 cells using MagVigen™- anti-Rabbit IgG magnetic nanoparticles. Please adjust the amount of reagents for specific application. Aliquot 20 μl MagVigen-anti Rabbit nanoparticle solution for cell separation experiment. Note: 20 μl is generally sufficient for the enrichment of (1-10) x 105 cells. Cell capture efficiency can be affected by factors such as frequency of target cells in the cell population, density of antigen/epitope expressed on the cell surface, and the antibody affinity. Adjust the amount of nanoparticles accordingly. Wash nanoparticles with 500 μl 1X Washing Buffer twice. Separate the nanoparticles from the solution by placing the magnet on the side of the tube for 1-2 min and remove the supernatant carefully (with magnet still on the side). Add 250 ng primary Rabbit antibody to the nanoparticle and incubate for 30-60 minutes using a sample rotator. Note: 20 μl nanoparticles could bind up to 1 μg antibody. Wash nanoparticle-Rabbit antibody conjugates with 500 μl 1X Washing Buffer twice to remove unbound antibody. Resuspend the nanoparticle-Rabbit antibody conjugates in 1X Washing Buffer (20 μl ) and add it to the cell sample to a total volume of 0.1-0.5 ml. Wash the nanoparticles with 500 μl cell culture medium twice. Note: Primary rabbit antibody can also be directly added to cell suspension, and then apply nanoparticles for cell capturing.